The Learning Design Summer Camp is today. Starts in less than 10 hours, in fact. I am on my way to bed after an evening of checking and rechecking my slides and wikipages, but I had a couple of observations I wanted to touch upon, and get my thoughts posted before I fall headlong into the hustle and bustle of camp. I feel the gearing up of anticipation for this camp, and it’s great watching some of these new additions to our twittersphere actually get excited about the event. I, too, am looking forward to another opportunity to meet some of these people I only know by their screen names. On the list of recommended things to bring to camp were business cards. 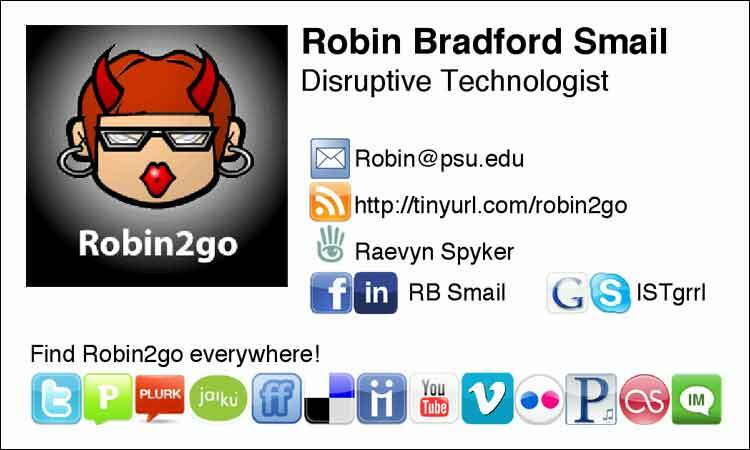 It took me two years to get business cards at my current position but, as I was collecting my camp supplies, I realized that my PSU business cards did not really provide any of the information I was likely to share at a two day event that focuses on social media, community, and learning design. Certainly my part (discussion Twitter and backchannel communications) was more about where the community could find me online. That is most definitely not on my institutional business card. So when I saw a chance comment on Twitter about someone who didn’t even have business cards to bring, I decided we needed to do a little grass roots rethinking. A half hour later and an online business card generator (found by Erin Long), and we had examples of community business cards for summer camp from @jdbalogh, @dancinjul, and @erinlong. I love that these people are using community created icons and reusing them to their own ends so that they can engage with their community in a different context. Today I did mine. It had been percolating in my mind over the weekend, and I knew I wanted to get as many of my social media IDs listed, but space is limited on a business card. However, I think it turned out relatively well, and the irony does not escape me that this colorful, creative “social MEdia card” is probably much more like me than my more professional, two color business cards from an academic institution. This is the information that my friends get—where to find me, how to locate me online, inworld, or where to find my stuff on the web. Why shouldn’t I be giving this to others who share the same space (or are at least beginning to explore it)? This is where I exist in the now, either professionally or individually; email, voice mail, interoffice mail are all things that are rather like an unintentional disconnect. I’m starting to wonder if old fashioned business cards aren’t also a thing of the past? If my life is about having a digital signature and a digital identity, then I think my cards should reflect that. But, for better or worse, we will see. I’ll have my social media cards AND my professional business cards with me at camp; we’ll see how many people prefer which version.